As a foodservice servicer I sometimes struggle to find my (my company’s) place in the consumer world. In dining the consumer is always the most important piece of the puzzle, everyone works together to help make sure they are satisfied. So how do you keep these customers in the loop when they are not necessarily your customers? Here at FoodCALC we do business with restaurants, eventually what we do trickles down to consumers, we don’t sell to them or promote to them, but we do get a lot of interest from them. I just couldn’t help but think we must have something to offer them while still being true to what we do and who we are. So we’re trying something new: meet The Dining Detective. The Dining Detective is consumer blog written by a health conscious diner to other health conscious diners. Detective Lara shares her experiences in dining from her perspective as a calorie counter and her victories with finding restaurant food that fits within her nutritional budget. We’re hoping to learn how consumers like Detective Lara and her many followers use the information that we and provide to restaurants. That way we can better understand what they need to accomplish and how to work with them to help them meet their end goal of rave reviews and satisfaction. I know that many of you also provide services to restaurants. Do you do anything through your business that deals directly with the consumer? Within all of the complicated and controversial new laws and regulations written in the US Health Care Reform Bill lies a national menu labeling law. The bill will affect all chain restaurants in the country with 20 or more location and will preempt all state and local menu labeling laws. Of course I'm stoked that soon we won't have to worry about many different pocket laws and differing regulations across the country. Restaurants that are part of a chain with 20 or more locations doing business under the same name (regardless of the type of ownership of the locations) and offering for sale substantially the same menu items. Condiments or items offered for general use. Specials/temporary items listed on the menu less than 60 days out of the calendar year. Test items offered on the menu for less than 90 days out of the calendar year. Menu Variability and Combination Meals: Regulations to be determined. Enactment Date: With in one year, exact date to be determined. 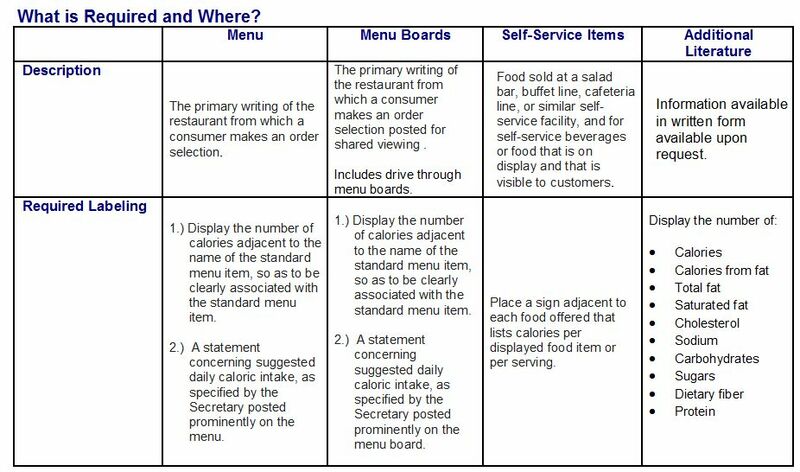 The goal of the bill is to help people make better choices by providing them calorie counts at the point of purchase. The affect of these laws on a local level has been mixed. Do you think we’ll see positive results nationally? If so how long will it take?